A selection of photographs celebrating the Malvern Hills district are now being showcased at Great Malvern Priory. The exhibition, which will run until 17 December, displays the winning photos chosen from a competition held as part of the district’s first ever EnviroWeek. Organised by Malvern Hills District Council, the week-long event in October encouraged residents to think twice about their impact on the environment by raising awareness of such issues as littering, dog fouling and plastic pollution. Budding photographers were invited to share their best photos of the district via email or on social media with the caption #MalvernEnviroWeek2018. More than 100 photos were submitted, ranging from stunning landscapes and rich heritage to wildlife and people enjoying the environment. 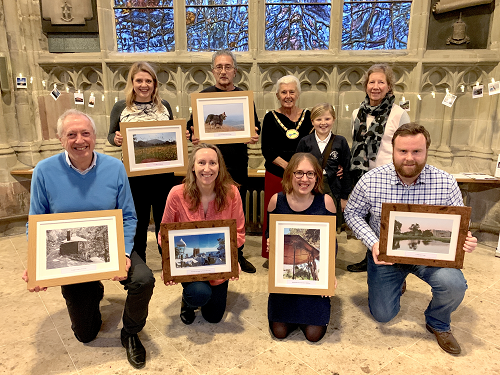 The top eight photographs were then chosen by a panel of judges at the Council House and feature much-loved landmarks including St Ann’s Well, Upton Bridge, Priory Park bandstand, Croome Court and of course, the Malvern Hills. Cllr Andrea Morgan, Chairman of Malvern Hills District Council, said: “It is lovely to see all of these wonderful images of our beautiful district displayed proudly in Great Malvern Priory. Each of these photos represent what is great about Malvern Hills and I think visitors will love reading the stories behind the photos. Hopefully it will inspire them to visit the scenes for themselves. The exhibition will run until 17 December at Great Malvern Priory.